Best practice is to remove flux residues and not contaminate the board during the cleaning step. A critical step in the process is final rinse flush. 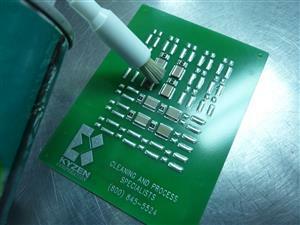 Residues must flow off the printed circuit card to prevent redeposition and cross contamination. Residues left on the board can redeposit elsewhere on the board. Best practice is to rinse with clean solvent followed by a wipe with a swab or lint free wipe to absorb the remaining cleaning fluid.